I walked into this museum just needing to go to the bathroom and I left fully inspired. PLEASE. 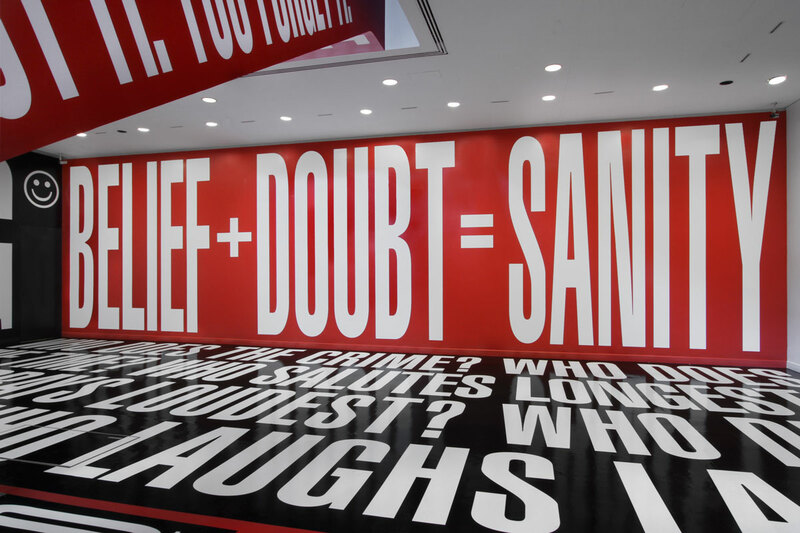 If you have the opportunity – visit the Hirshhorn Museum and experience Belief + Doubt yourself. Part of an initiative to bring art to new sites within and around the building, this installation by Barbara Kruger fills the Lower Level lobby and extends into the newly relocated Museum bookstore. Famous for her incisive photomontages, Kruger has focused increasingly over the past two decades on creating environments that surround the viewer with language. The entire space—walls, floor, escalator sides—is wrapped in text-printed vinyl, immersing visitors in a spectacular hall of voices, where words either crafted by the artist or borrowed from the popular lexicon address conflicting perceptions of democracy, power, and belief. At a moment when ideological certitude and purity seem especially valued, Kruger says she’s “interested in introducing doubt.” Large areas of the installation are devoted to open-ended questions (“WHO IS BEYOND THE LAW? WHO IS FREE TO CHOOSE? WHO SPEAKS? WHO IS SILENT?”), while the section occupying the bookstore explores themes of desire and consumption. At once addressing the individual, the museum, and, symbolically, the country, Kruger’s penetrating examination of the public sphere transforms one of the Hirshhorn’s key public spaces.